The summer temperatures may send London into meltdown, but that doesn't mean that publications have stopped. Hot off the presses is, "Innovation and IPRS in China and India: Myths, Realities and Opportunities," edited by Kung-Chung Liu and Uday S. Racherla. The book is a collection of essays from IP experts around the world. Part I of the book looks at doctrinal and empirical analysis, and Part II looks at China and India separately. Naturally this Kat was drawn to the empirical analysis. A chapter by Racherla investigates the relationship between IPR and innovation. Racherla performs a literature review of studies by the USPTO, the EU IPO and case studies of technological and business model innovations in the U.S. and India. Asking, "Do IPRs Promote Innovation?," he answers, "it depends." Racherla develops what he calls the, "Is and IPRs model." 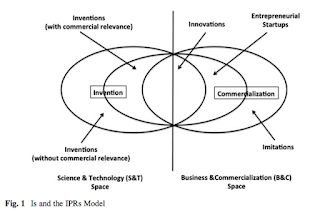 He argues that innovations (Is) and IPRs can be divided along a main axis ranging from the Science and Technology (S&T) space to the Business and Commercialization (B&C) space. "Inventions" are concentrated in the S&T space where patents are the preferred method of protection, whereas business models, commercialisation strategies etc. inhabit the B&C space and prefer trade marks and copyright. He argues that in both of these spaces, the evidence that IP promotes innovation is weak; in S&T, "the percentage of conversion of patents into commercial products/services as a measure of the IPR promotability of innovation," and in B&C, "the impact of these trademarks and copyrights on breakthrough or disruptive innovations," both provide unconvincing arguments for a direct innovation-IPR link. However, he argues that his Is-IPR model leads to two conclusions: 1) not all IPR promote innovation and, 2) "only IPRs protecting sustainable innovations – which possess economic, social, and/or environmental value – promote innovation." As is often the case in policy and innovation, it depends. A second empirical paper asks, "Does Patent Strategy shape the Long-Run Supply of Public Knowledge? : Evidence from Human Generics," by Kenneth Huang and Fiona Murray. The authors collect data on, "patent-paper pairs" which are when the same, "piece of knowledge is contributed to both public and private knowledge streams through its disclosure in both publication and patent." They argue that studying these pairs allow for assessment of patents, public and private knowledge, and policy. Focusing on human genetics, the article uses 1,300 of these patent-paper pairs to find, "patent strategies - patent scope, patent ownership, patent landscape complexities, and the commercial relevance of patented private knowledge - negatively impact the long-run production of public knowledge." It's quite a long chapter, running 40 pages. The book covers an eclectic mix of topics. One very nice aspect of this book was its use of colour in images and artwork, which is fairly rare these days. Liu, Kongzhong, and Uday S. Racherla. Innovation and IPRs in China and India: Myths, Realities and Opportunities. 2016 is available for £82 e-book and £86 hardcover. Rupture factor: low, 224 pages. The conclusions are going to be very technology specific. There's no point filing a patent to an app for taxi services, but you must file patent applications as a biotech company with no other tangible output. Also the answers must be different depending on what type of economy you are in. If you are in the US with a high tech, innovation rich, culture your IP strategy will be different to being in a developing country. It is (of course?) imperative that the nature of patent law - being individual sovereign-centric always be remembered. Yes, there is to be (or attempts to be) comity between the sovereigns, but make no mistake - patent law IS a law for within a sovereign. This is not to say that there are forces (typically TRANS-national corporate forces) that would want patent law to either be a very weak-sovereign base, or a highly pliable (read that as one influenced by $) base.